Streamline Plumbing works with many property management companies and HOAs in Orange County, Los Angeles and The Inland Empire. If you are a Home Owner Association or property management company then please call us today for all your plumbing needs – from repairs to monthly maintenance, to large installations. We take pride in providing 24/7 service, and with a rapid response and affordable pricing, Streamline Plumbing is the best choice when you need professional help. Our online reputation speaks for itself with 5 Star reviews all over Facebook, Google, Yelp, etc. Our goal is to build long-term relationships with all of our customers, especially property management companies and HOA’s. With over 25 years of experience here in Southern California, Streamline Plumbing has become a company our customers can count on. Being family owned and operated has allowed us to focus on the most important thing – the customer! At Streamline Plumbing we understand that property management companies (and HOA’s) have a lot of responsibility to take care of their residents/tenants, and we take our role very seriously. 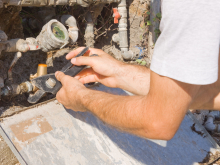 Our technicians specialize in property management plumbing repairs, and when other plumbing companies can’t fix or repair the major issues, that is when you need to call Streamline. We are very flexible and can work around your schedule when it comes to getting you an estimate, or when doing the repairs. The customer always comes first at Streamline Plumbing. Getting a Free 2nd Opinion For Property Management Plumbing Repairs. If you are dealing with other plumbing companies that seem unreliable, too expensive, or just not right for your situation, then call Streamline Plumbing today and get a second opinion. Always research any plumbing company before you hire them – check their references and contractor license, etc. etc. We look forward to hearing from you, and remember at Streamline Plumbing “No job is too big or small”.